Welcome to week seven of Re-Play! A ten-week series where we go look back in time to visit some of the greatest games of the past, give them an honest review, and see how well they still hold up today! This week we are looking back on one of Square’s forgotten RPGs; Secret of Evermore. 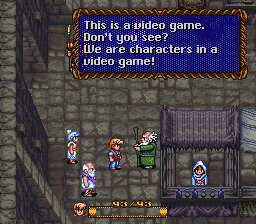 The year is 1995, and Square is dominating the role-playing game genre. However, every entry up this point had been primarily developed for Japanese audiences and then translated for the rest of the world. For most of there previous games, audiences had minorly felt like there were some cultural references and ideas literally lost in translation. This led Square to start working on Secret Of Evermore exclusively in the United States and designed primarily for American audiences. This resulted in a clever, charming game which was full of American pop culture references and dialog which sounded more natural to Americans. Finally, in October 1995, Secret of Evermore hit American store shelves but was sadly overshadowed by the infinitely more popular Final Fantasy VI and Chrono Trigger which was released around the same times. This did not stop Secret of Evermore from developing quite the cult following, as it offered something to American audiences that neither of the others could: familiarity. Following the “American” theme, the story of Secret of Evermore follows an unnamed boy and his shape-shifting dog(more on that later.) After leaving a B-Movie in their small town of Poduck, the dog chases a stray cat into an abandoned mansion, and the boy follows. They stumble onto a defunct laboratory and accidentally get transported the fantastical world of Evermore. The boy and his dog, venture throughout Evermore in an effort to find a way home. However, Evermore is wildly diverse with four different lands which are themed after different periods of time. These lands are Prehistoria (prehistory), Antiqua (classical antiquity), Gothica (the middle ages), and Omnitopia (a high-tech distant future). In addition to each area visual being different, the people and monsters are appropriately themed as well. Your dog also shape-shifts when you change in between lands from everything like a massive wild beast dog in Prehistoria to a robot-toaster-dog in Omnitopia. Each land is filled with its own story arcs, filled with tongue-in-cheek humor, wild adventures, and epic battles. Speaking of the battles in this game, boy are they fun. Square decided to copy parts of the wildly popular combat system from their previous game, Secret of Mana. This system has a few unique features, the first of which is that physical attacks must be recharged after every use, making the player think strategically about when would be best to use their attack, as they cannot effectively attack again for a few seconds afterward. The second feature is that instead of a pause secret, the world around the characters pauses, and a ring appears around the boy which allows you to go through his inventory on the fly, while still keeping an eye on what the battlefield looks like around him. This can be used for using items, changing equipment, or casting Secret of Evermore’s unique attacks known as Alchemy. Alchemy is a spell system which is unlike any before in Square’s repertoire. Instead of using MP or magic points like other RPGs, you must craft each spell individually in order to cast them. Luckily ingredients are plentiful in the overworld, often found in chests, sold in shops or sniffed out by your dog. Players must also be taught each new spell by different characters found in Evermore, which encourages players to frequently explore because they don’t know what crazy spell they will find next. In addition to the normal “fantasy” type of spells, the game offers more realistic attacks such as summoning acid rain or creating nitroglycerin to make an explosion. The visuals in this game were some of the finest sprite-work on the Super Nintendo and still are to this day. Each of the four lands is beautifully designed, from the classical Greek and Roman influences in Antiqua to the medieval castles, forests, and dungeons of Gothica. The enemies and bosses within the game are often massive as well and gorgeously designed making each battle truly epic and unique. There is so much beautiful art within Secret of Evermore they had to increase the size of the memory of the SNES cartridge just to hold it all. This even became a selling point for the game, as it was advertised to have 24-mb of memory, which was relatively unheard of for a game at this point in time. There is definitely something to be said about the soundtrack as well. The score was composed by a man named Jeremy Soule, and it was his first time scoring a video game. He is quoted as saying that he had always felt growing up that video game music “lacked drama and intensity”. Square decided to give Soule a chance, and it was a good decision to do so. Soule’s score for Secret of Evermore perfectly captures the eras in time of each land in Evermore, while simultaneously allowing for by drama and levity when the scene calls for it. His music just feels right, as if you can’t imagine hearing anything else besides it while playing the game. To answer the above question: Unbelievably well. I dare say that Secret of Evermore feels like it hasn’t aged at all. The graphics are still crispy looking, and the story and gameplay are still both engaging and fun. Sadly, unlike my previous reviews Secret of Evermore has never been released on another console since its initial 1995 release, so it is much harder to get your hands on today. If you somehow manage to, however, this game is well worth your time. Secret of Evermore was one of the first RPGs I ever bought as a child, and it will always stay near and dear to my heart as one of my favorite games. Who knows, if you give it a play maybe it will become one of your favorites too.